SMELLEZE Urine Solidifier & Odor Remover: 50 lb. Bedpan, Portable Urinal & Travel John Urine Super Absorbent Summary Super urine absorber solidifies & deodorizes urine. Smelleze® Urine Solidifier & Smell Removal Granules are excellent for use in travel john, portable urinal, travel toilet & travel urinal to prevent urine spills & odors. Encapsulates several hundred times it's own weight in urine in seconds. Features & Benefits • Simply sprinkle on urine & smell the difference • Eliminates urine smell without masking it • Encapsulates & solidifies urine in minutes • Urine clean-up is quicker & more convenient • 1 Teaspoon can absorb 10 oz. urine • Made in USA Super Absorbent Soldifies, Encapsulates & Deodorizes Urine Spills These state of the art super absorbent granules were specially designed to absorb several hundred times its own weight in urine. Each teaspoon has the ability to absorb over 10 oz. (300 ml) of urine. 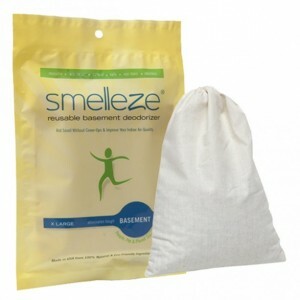 In addition to absorbing urine quickly, the Smelleze® Urine Solidifier & Smell Removal Granules will also eliminate odors and keep your environment clean. The Smelleze® Urine Solidifier & Smell Remover Granules are ideal for eliminating accidental urine spills and odors in homes, cars, hospitals, and nursing homes. This product can be effectively used for both people and pets. 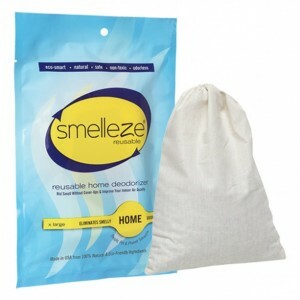 To use, simply sprinke the Smelleze® Urine Solidifier & Odor Removal Granules over the urine spill. The urine will be quickly absorbed by the granules on contact and converted into a solid gel. The absorbed urine will not leak from the gel even under significant pressure and is easily disposed.